A composite material is a heterogeneous material composed of two or more integrated constituents for enhanced structural performance. Thanks to the improved strength and reduced weight as compared to conventional materials, composite materials have many potential use cases in diverse fields. Development efforts are underway in industry to embed functionality like sensing, actuation, computation, and communication into composite materials known as smart composite materials. A thorough understanding of the behavior of such materials is necessary in order to design the most accurate and reliable composite structures. The Composite Materials Module is an add-on to the Structural Mechanics Module that brings you modeling tools and functionality tailored for analyzing layered composite structures. Some of the common examples of layered composite materials are fiber-reinforced plastic, laminated plates, and sandwich panels. These layered composite materials are widely used in manufacturing aircraft components, spacecraft components, wind turbine blades, automobile components, buildings, boat hulls, bicycles, and safety equipment. 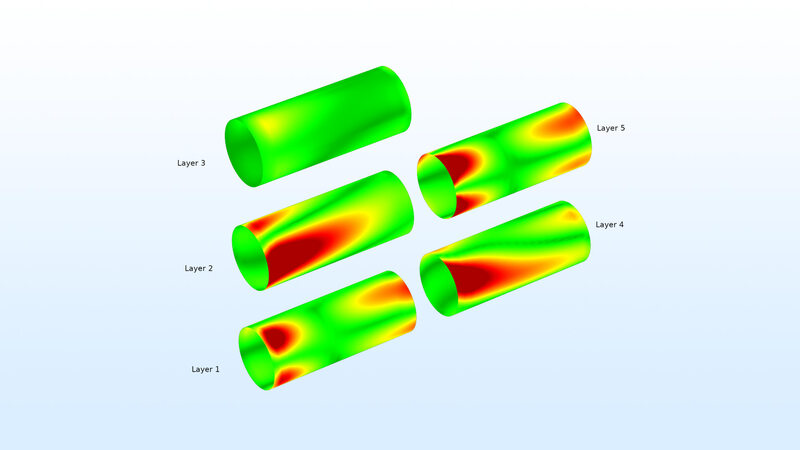 The Composite Materials Module utilizes specialized Layered Material technology and provides two approaches that you can use to accurately model composite shells: layerwise theory and equivalent single layer theory. 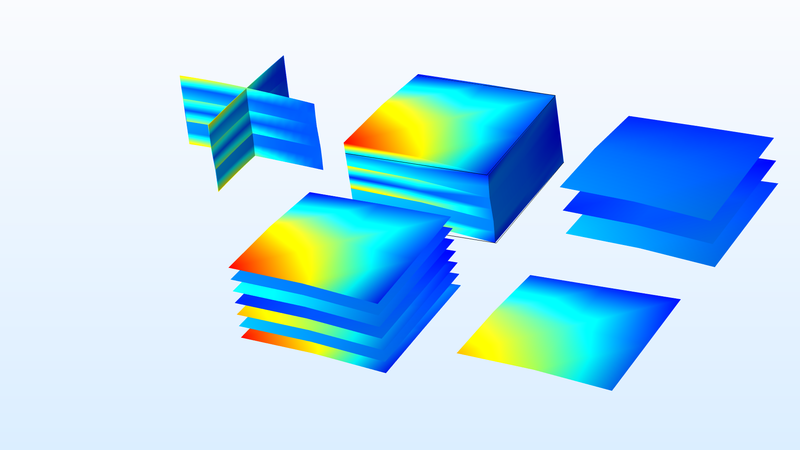 Additionally, when you combine the Composite Materials Module with other modules from the COMSOL® product suite, you can extend your models to include heat transfer, electromagnetics, and fluid flow effects — all within the same simulation environment. The Structural Mechanics Module provides predefined physics interfaces with specialized settings to more easily set up and run analyses. The Composite Materials Module includes additional interfaces and material models to simulate composite laminates, depending on which layer theory you prefer and the type of analysis you are running. 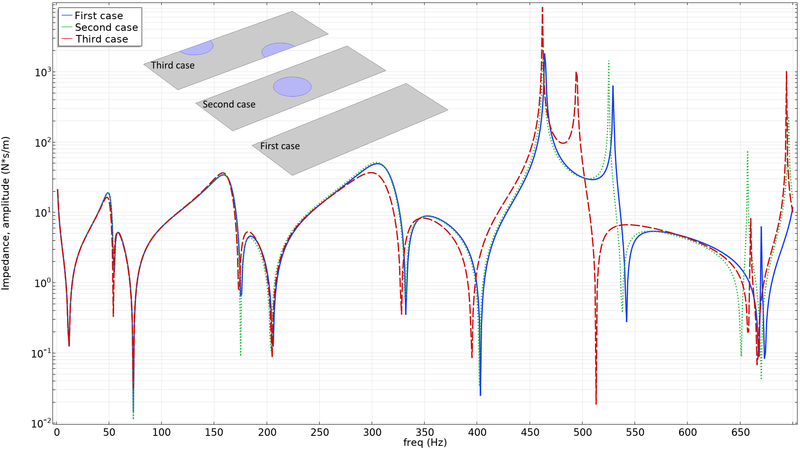 Along with the regular structural analyses (such as stationary, eigenfrequency, transient, linear buckling, and other analyses), you can also perform first-ply failure and multiscale modeling. Since they are engineered materials, the composite laminates are prone to different kinds of failure modes. Thus, it becomes essential to perform various kinds of failure analyses for composite laminates. 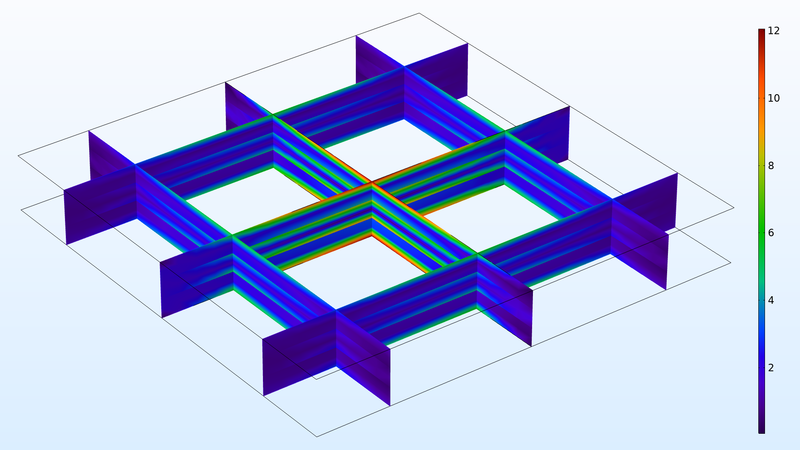 Note that you can also optimize the geometric dimensions, composite layup, ply thicknesses, fiber orientations, and material properties of your designs with the add-on Optimization Module. View more details on what you can model with the Composite Materials Module below. The Layered Shell interface, available in 3D, provides an approach based on layerwise theory for a detailed analysis of composite laminates. Boundary conditions can be placed on individual layers as well as on individual interfaces between layers. The materials in the individual layers can be nonlinear. It also supports different shape order for the displacement field in the reference surface and in the through thickness direction. The results include full 3D stress and strain distributions, so you can compute interlaminar stresses and study stress variations inside each lamina, for example. The formulation of this physics interface makes it suitable for thick to moderately thin composite shells with a limited number of layers. Stresses in a simply supported three-layer composite laminate subjected to bending. With the Composite Materials Module, the Shell interface is augmented with a new material model: Layered Linear Elastic Material. It is based on the first-order shear deformation theory, which is a class of equivalent single layer theory, where all layers are aggregated into an equivalent material. The results include full 3D stress and strain distributions, so you can study stress variations inside each lamina, for example. This material model, which is suitable for thin to moderately thick shells, can accommodate many layers without significant performance impact. The analysis of a composite laminate is comparatively difficult, as it involves different geometric scales. The analyses performed at two different scales are known as micromechanics analysis and macromechanics analysis. In general, a lamina consists of fiber and matrix materials. The homogenized properties of a lamina depends on the constituents' properties as well as the volume fraction in which constituents are mixed. Micromechanical analyses deal with the modeling of individual lamina or its representative unit cell having fiber and matrix materials. 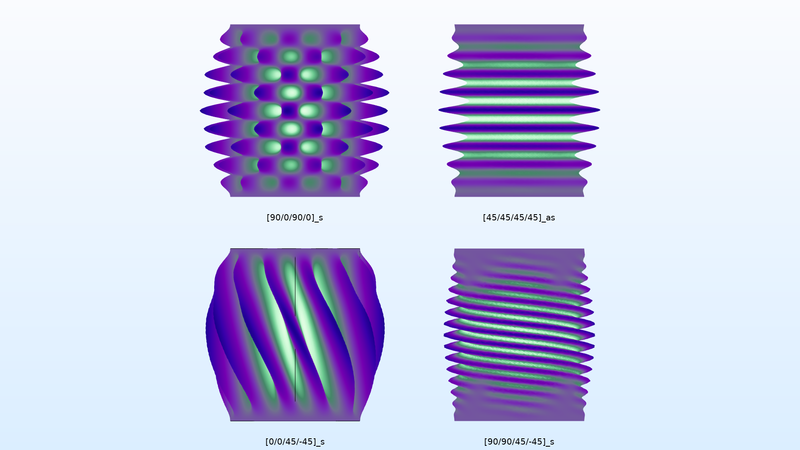 The aim of this analysis is to compute the homogenized material properties of a lamina. Representative unit cell for a fiber composite with a 20% fiber volume fraction. The model is used for determining an equivalent average anisotropic material. Buckling of a composite laminate is a common phenomenon and, therefore, an important design criterion. It is crucial to design a composite laminate that can withstand compressive or torsional buckling loads. In the COMSOL Multiphysics® software, either of the laminate theories can be used for computing the critical buckling load factor of a composite laminate. Buckling mode for the same composite laminate with different choice of fiber orientations in the lamina. A composite laminate consists of many layers glued or laminated together. Under different loading conditions (in particular, impact loading), the bond between the two layers can break in a specific region. Modeling of the delaminated region becomes crucial in order to accurately predict the response of a damaged composite laminate. 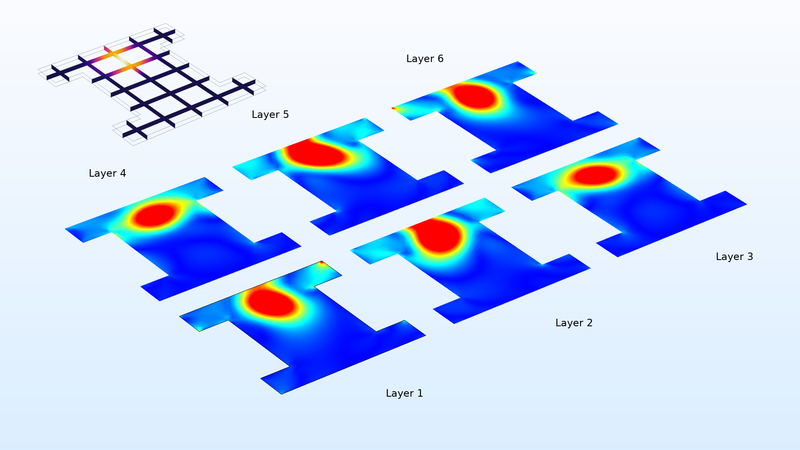 In COMSOL Multiphysics®, this can be achieved using the layerwise-theory-based Layered Shell interface. There, the Thin Elastic Layer, Interface node can be used for modeling the delaminated region between different layers of a composite laminate. Impedance of a composite laminate at different frequencies. 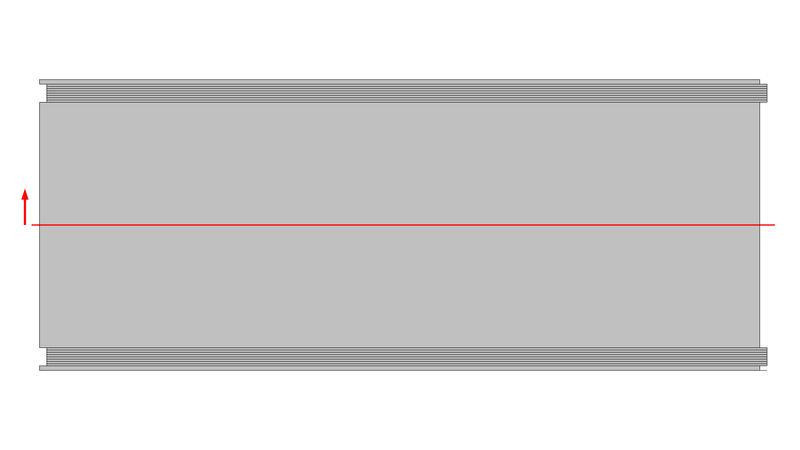 The results are compared for a laminate with and without debonded regions (shown in the inset). 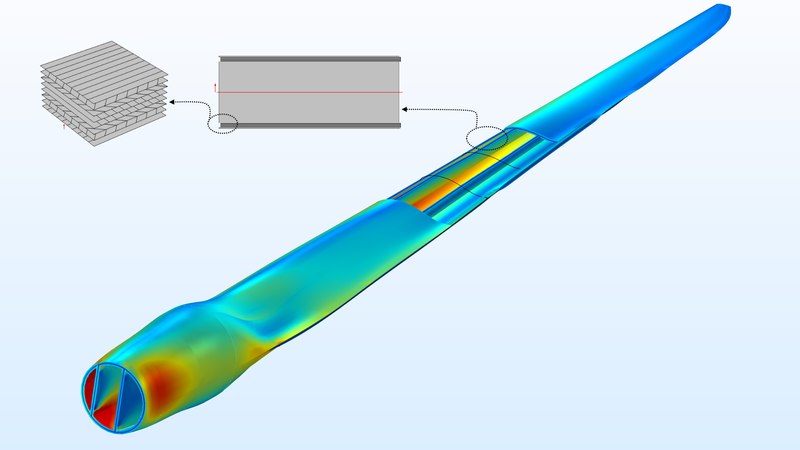 The Layered Shell interface can incorporate nonlinear material models in a layered composite when used in combination with the Nonlinear Materials Module. It is also possible to add different nonlinear material models in different layers of a composite laminate. The composite laminates, modeled using either the Layered Shell interface or the Layered Linear Elastic Material node of the Shell interface, can be coupled with other structural elements in a multibody system, when combined with the Multibody Dynamics Module. In many situations, a composite laminate is designed based on the structural requirements, but there are some cases where other physical phenomena must be taken into consideration. There are two fundamentally different types of interaction between the mechanics in the laminate and other processes: those that occur within the laminate layers and those that occur with the laminate as a boundary. Some physical processes occur inside the laminate, where the thermal and electrical effects are significant, and it is important to design the laminate based on the combined response. The layered material technology allows you to use different physics interfaces in the same layered material, and you can solve for all of the physical phenomena simultaneously, including the couplings between them. From a structural design point of view, both laminate theories can be coupled to thermal and electrical modeling of composite laminates. One such example is Joule heating and thermal expansion of a composite laminate. To access these multiphysics couplings, the Heat Transfer Module and AC/DC Module are required for the thermal and electromagnetic interactions, respectively. In other physical processes, the laminate acts as a boundary for a 3D domain where something important occurs. The equivalent-single-layer-theory-based Layered Linear Elastic Material in the Shell interface allows you couple the composite laminate with a surrounding fluid using the Fluid-Structure Interaction multiphysics coupling node. 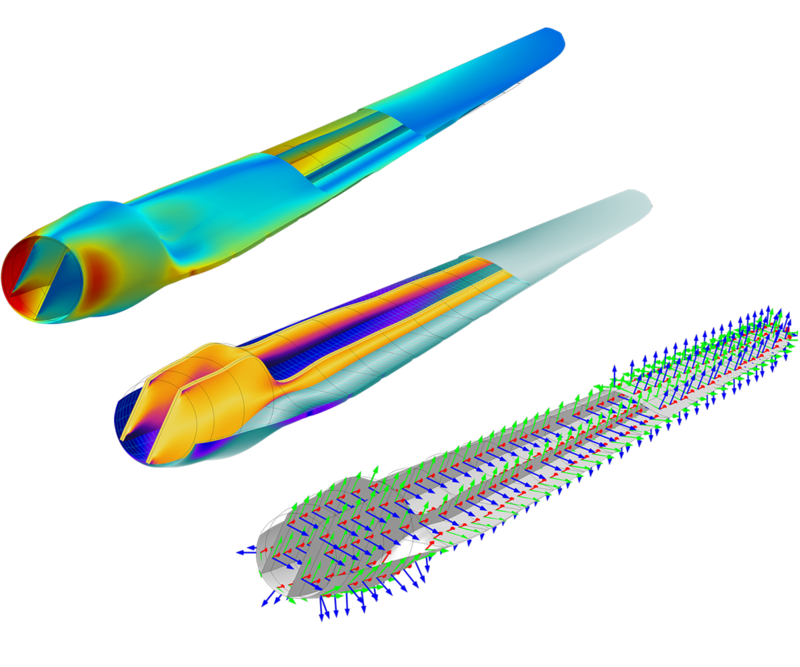 This functionality is readily available for laminar flow, as well as turbulent flow when combined with the CFD Module. Similarly, in order to model a vibroacoustics problem, you can couple the composite laminate with a surrounding acoustic domain using the Acoustics-Structure Boundary multiphysics coupling node, accessible when combined with the Acoustics Module. Equivalent stress distribution caused by heating in a six-layer composite. Composite laminates are made up of several layers of different materials, fiber orientations, thickness, and so on. In order to visualize the layup and provide the information in a convenient manner, the Composite Materials Module offers a set of specialized tools. Additionally, since composite laminates are anisotropic in nature and generally heterogeneous in the through thickness direction, it is usually not sufficient to evaluate results only on the reference surface. You need to evaluate results in each layer as well as in the through thickness direction. The Layered Material node can be used to define a layup where each layer has its own material data, thickness, and principal orientation. Layered materials defined in this way can be combined using the Layered Material Stack node to create more complex layered materials, which is particularly convenient when the layup is repetitive, or when modeling ply drop-off. You can also define material properties for the interfaces between layers. In order to visualize the input data of a composite layup, there are two preview plots Layer Stack Preview and Layer Cross Section Preview. The Layer Stack Preview plot depicts the number of layers as well as the principal fiber orientations in each layer. 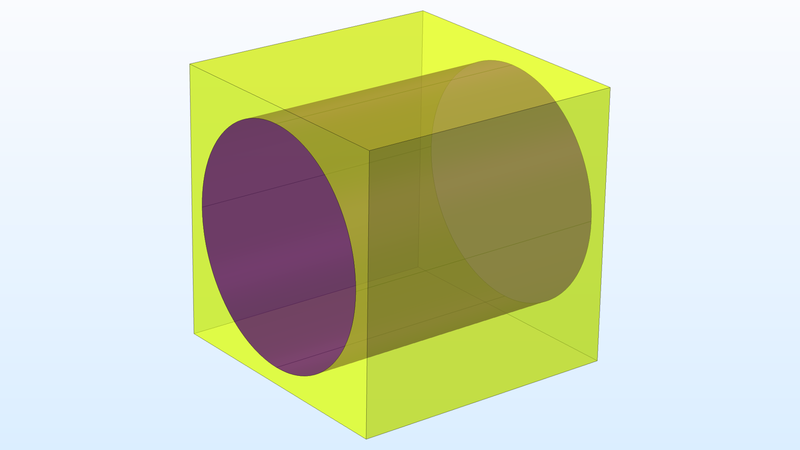 The Layer Cross Section Preview plot shows the thickness of each layer together with the position of the reference plane. When joining two different laminates in a side-by-side configuration or modeling a ply drop-off situation, it is possible to use the Layered Material Stack node together with the Continuity node in the Layered Shell interface. The connection area of the two laminates can be controlled through different options. 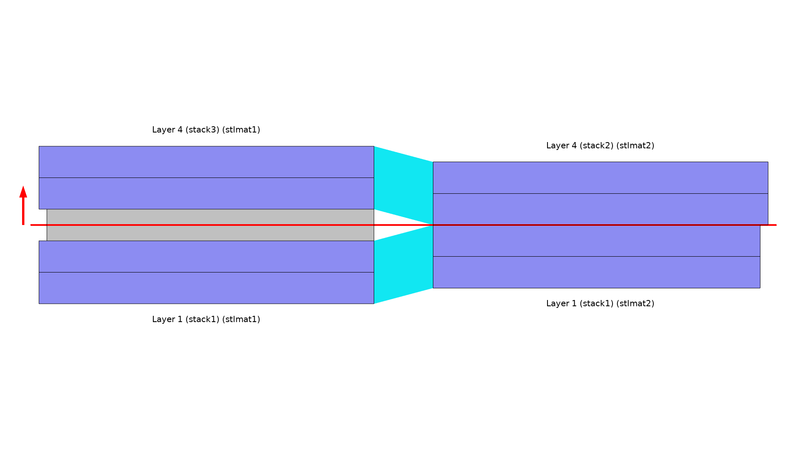 The connected layers from both the laminates can be visualized using the Layer Cross Section Preview plot available on the Continuity node. Even though the composite laminate is modeled as a surface (2D) geometry, you can visualize the results on a geometry with finite thickness using the Layered Material dataset. It also allows you to scale the geometry in the thickness direction for better visualization as thin laminates. Using this dataset, you can plot the results either as a surface on a 3D geometry or as slices in the 3D geometry. The Through Thickness plot enables you to visualize the variation of any quantity at a particular position on the boundary against the laminate thickness. You can select one or more geometric points on the boundary or optionally create cut point datasets. It is also possible to specify the point coordinates directly. Unlike other graphs, the result quantity is plotted on the x-axis, while the thickness coordinate is plotted on the y-axis. The layup of a layered material, together with a layer stack preview plot showing principal fiber orientations of each layer. The cross section of a laminate made up of five sublaminates. The thickness of each layer and the reference plane position are shown. The connection between two layered materials meeting side by side. Ply drop-off is depicted. Different types of visualization of a thick three-layer laminate using the layered material dataset. Stresses in all of the layers of a tube designed as a five-layer composite laminate. 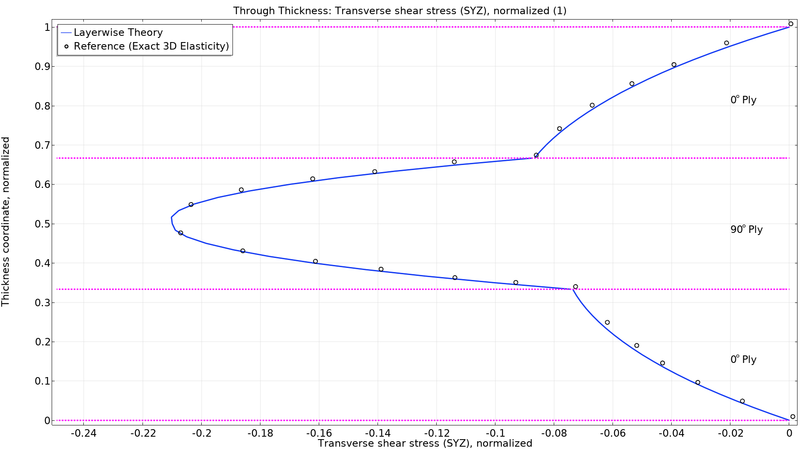 Transverse shear stresses in a three-layer laminate, comparing the Layered Shell interface and exact 3D solution.